« 17 Reasons to Visit Walt Disney World in 2017! 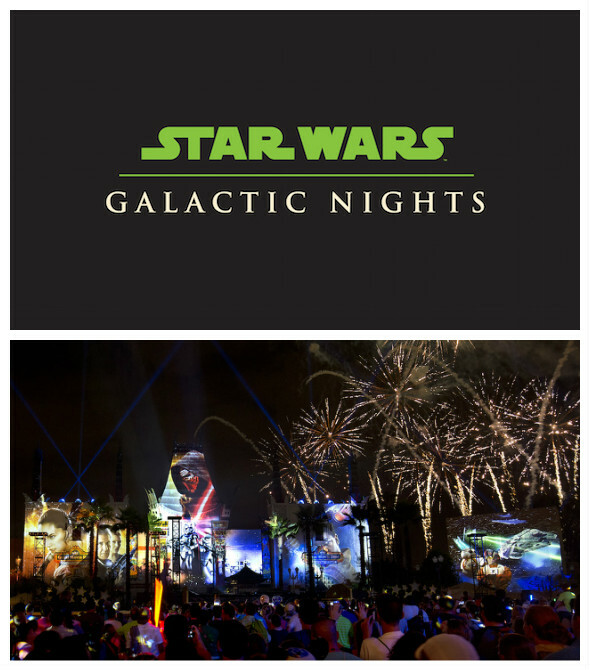 Star Wars Galactic Nights, a new Hollywood-inspired special event will debut at Disney’s Hollywood Studios® at Walt Disney World® Resort on April 14, 2017. You can come dressed as your favorite character and celebrate forty years of Star Wars milestones. •Rebel Base Activities – The Rebel Base will serve as the event hub with multiple events, hosted shows, and more taking place in the center of the park. The Rebel Base is the stop to see “Celebrate the Saga,” a 40-year history of Star Wars that features rarely seen imagery; you can join in on Star Wars dance parties and more. •Watch “Inside the Saga: Celebrity Chat Show” – You can catch a celebrity chat show in Epic Theater to learn more about the making of Star Wars films. •Can’t miss Star Wars photo ops – You can don your Star Wars finest and enjoy iconic Star Wars backdrops, including Han Solo cast in Carbonite, Jabba the Hutt’s Palace, the Hoth Wampa Cave and more. •Galactic Nights Stars in Cars Motorcade – This procession will welcome in Star Wars celebrities down Hollywood Blvd. •Imperial March & March of the First Order – Darth Vader will lead a battalion of Stormtroopers on a dramatic march down Hollywood Blvd to the Event Stage. Captain Phasma will also lead a unit of First Order Stormtroopers through the park, pausing to give a demonstration of power and strength. •Seize the Saga Interactive Scavenger Hunt – Event Guests are challenged to collect eight clues in the form of puzzle pieces, one for each Star Wars film, at the party’s various photo stops. Each piece can be affixed to the back of the event lanyard to reveal a surprise. •“Star Wars: A Galaxy Far, Far Away” – You can watch high-energy clips of the best moments from the film saga juxtaposed with character moments on stage, featuring Chewbacca, Darth Vader, Kylo Ren, and more. •“Star Wars: A Galactic Spectacular” – The skies will come alive with the power of the Force, as the park’s popular Star Wars-themed nighttime spectacular lights up the night. Additional offerings will include the chance to experience Star Tours-The Adventures Continue attraction, Star Wars Launch Bay, AWR Trooper sightings, roaming Droids, Star Wars-themed food and beverage, special merchandise, and much more! Begin planning your vacation to Walt Disney World! This entry was posted on January 11, 2017 at 3:51 pm and is filed under Disney News, Disney Vacation Planning, Hollywood Studios, Special Events, Walt Disney World. You can follow any responses to this entry through the RSS 2.0 feed. You can leave a response or trackback from your own site.